I rarely stray from the muddy banks of the Dee. Most of my birdwatching and photography is done within a few miles of my home. It is my Patch, my little slice of the birding pie. It was entirely by accident that I developed this parochial approach to nature. Some people will travel long distances to see birds, and that is cool, it is just I never liked the urgency of the chase or the faff of the travel... etc. From this laziness came an appreciation of what is right on my doorstep. The Patch. What I call the Patch is not one small defined area, it is a loose collection of sites that I like to spend time at, and during the course of many hours on these sites I have come to know them so, so well. Currently patch watching is really popular (I suppose it always has been, but it does seem to be increasing at the moment) and patches are popping up all over the place. As a general rule people are pretty cool about sharing the birds on their Patches but I have met the odd one who doesn't seem happy with people encroaching on their territory. For some it seems, there are borders and boundaries, lines that shouldn't be crossed. When I was a kid I had boundaries. I was allowed around our capital "I" shaped close but wasn't allowed along the footpath to the large grassy roundabout behind. The main road just south of the close was out of bounds too. They were other people's playgrounds. Now I have self imposed borders. I will cross them on occasion but on the whole I tend not too. Anything to the east of Gilroy and south of Riverbank Road I consider to be alien country - The Outer Rim. I don't consider my Patch to be any better or worse than other people's patches, its just I like mine like I like my favourite pair of trainers. Comfortable, it just 'feels' right in my Converse/on my Patch. 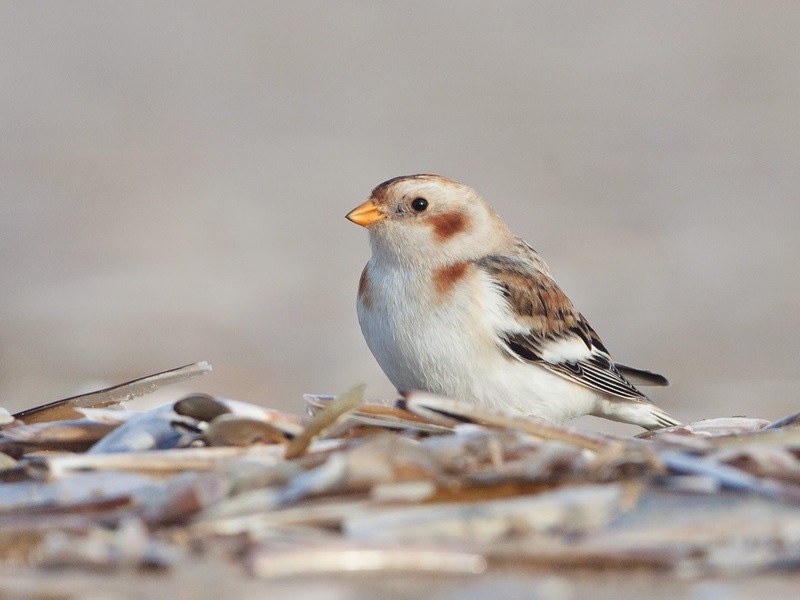 There have been a couple of Snow Buntings close by all winter. Not on my Patch though. 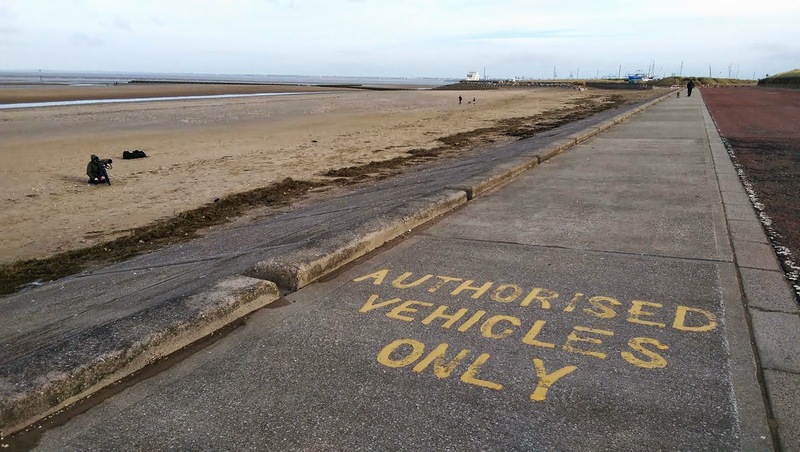 I have resisted the temptation to go and photograph them, hoping that I would get one or two visiting me, most likely on Hilbre, maybe on Thursatston Shore. 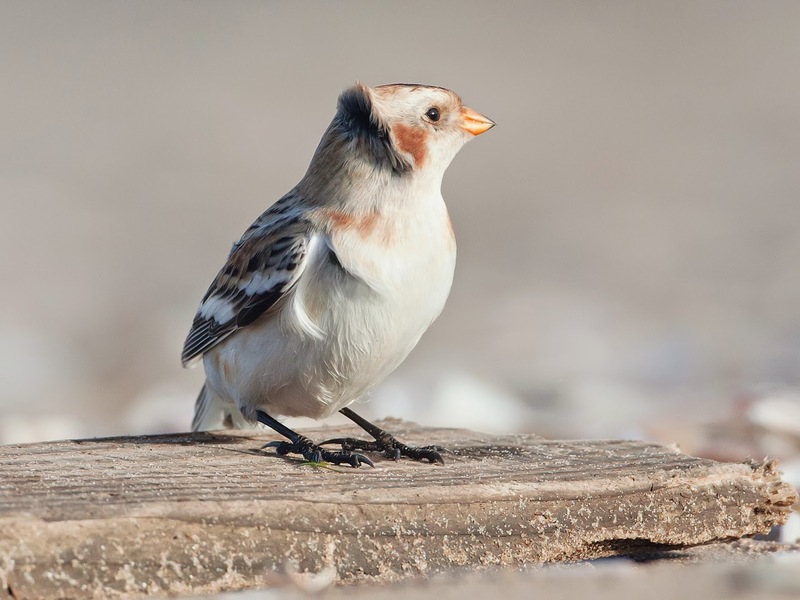 Alas, as we plodded through January there were no signs of Patch Buntings. So here I am. Off-Patch. 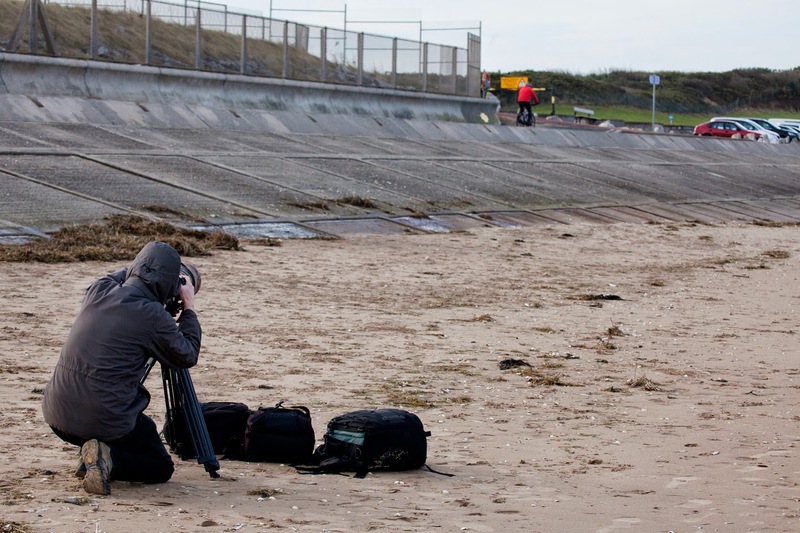 With my dad on Wallasey Beach looking for Snow Buntings. That's him in the picture, crouched behind the tripod mounted camera. 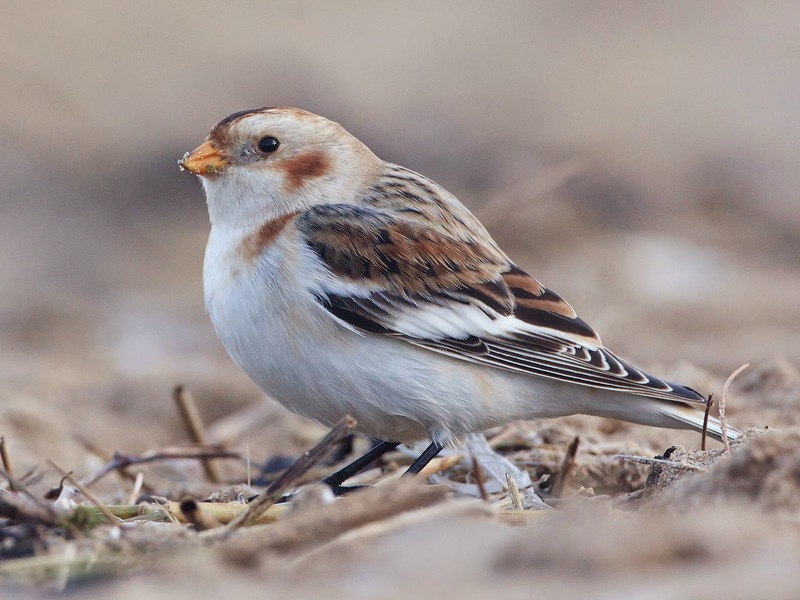 The Bunts were easy to find, 2 of them feeding and mooching along the tide line close to the busy embankment. We spent a chilly couple of hours with them on a sunny Monday morning. 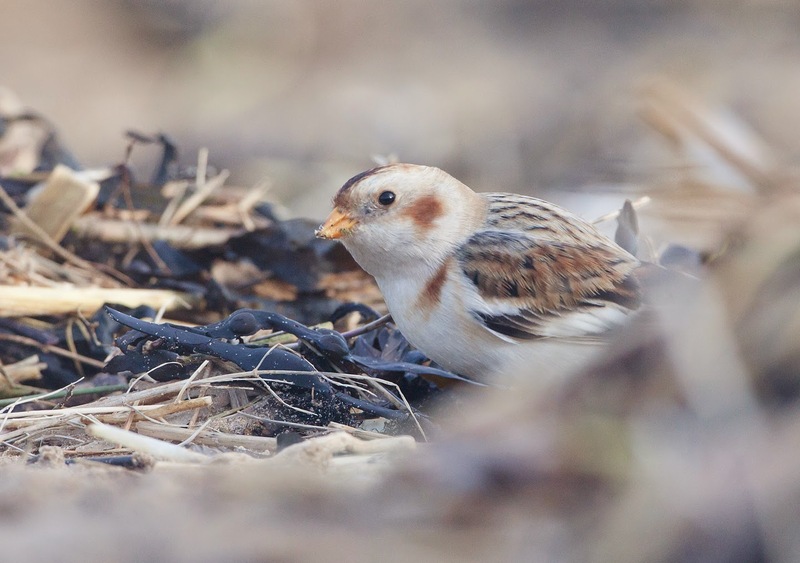 While most people were opening emails at the start of the working week, we were getting sandy shots of these obliging Snow Buntings. 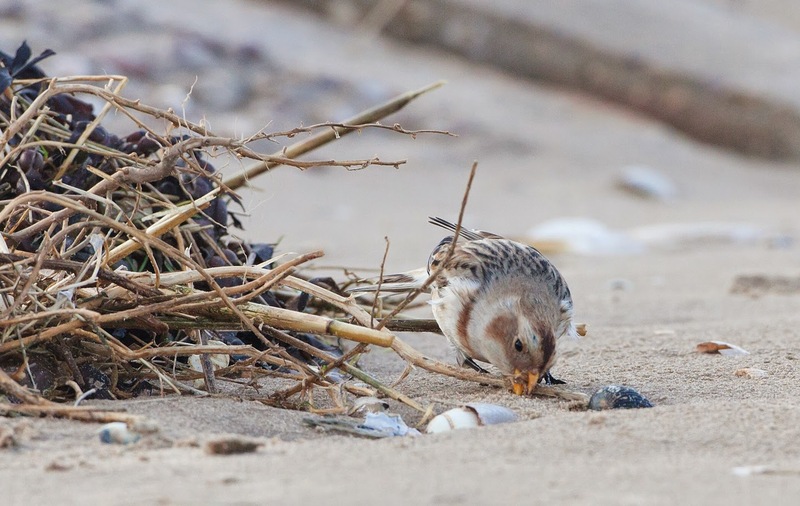 The birds fed on seeds and vegetation plucked from the strandline on the busy shore. 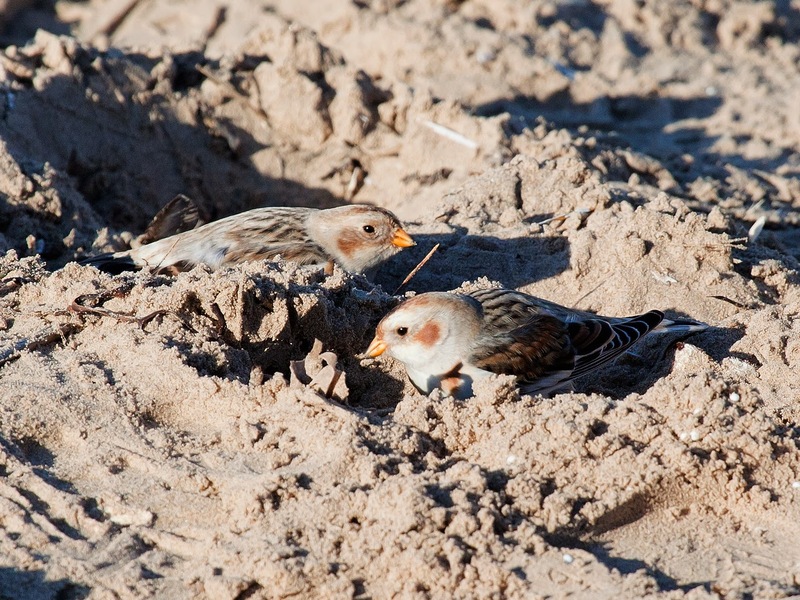 This species is renowned for being tame, and these two birds have obviously become very used to beach life on this corner of the Wirral, a corner that they could rightly call their Patch. That is something that we do not forget, this is the bird's territory and they will exploit it so they can survive the winter. It would not be on for us to disturb them at all. Keeping a safe distance, we can see the birds do not alter their behaviour while we are there. We get some images of them scrabbling around the washed up vegetation, appearing and disappearing amongst piles of seaweed. Dog walkers come and go, flinging sticks for excited pooches. Cyclists whizz by on the embankment. A tractor/trailer and JCB combo clear wind-blown sand from the adjacent road and the birds don't flinch. 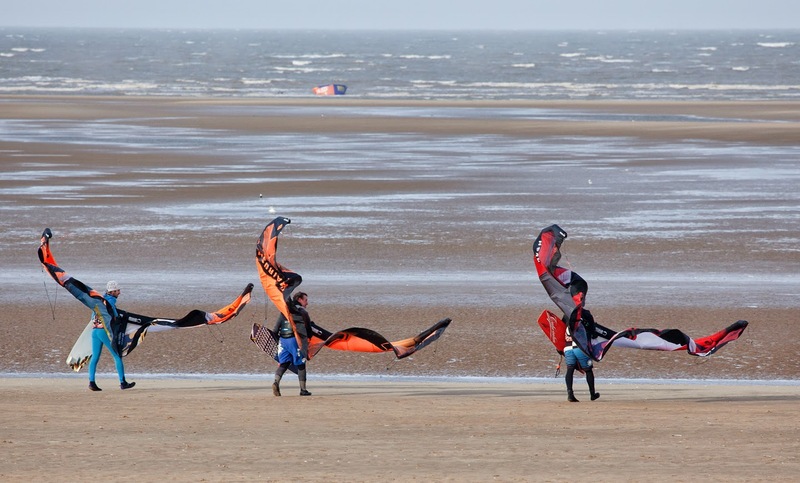 Three kite surfers brave the freezing conditions to take advantage of the stiff breeze that is blowing, these too are no bother to the two intrepid Bunts. We get more pictures. The same chill breeze that is propelling the surfers is fluffing up the thick feathers of our Bunts. I lie down on the sand to get a low angle on our birds. They continue to feed and turn my way. They hop closer and closer, I can see the grains of sand on their bills. Eventually they come within the minimum focussing distance of the lens and I can't take any more pictures until they hop away again. To be able to appreciate these birds at such close quarters without disturbing them is a treat. As fast as the memory cards are filling up my stomach seems to be emptying. I'm burning breakfast at a rate of knots in this cold weather. We decamp to a local cafe to warm up with a cuppa. 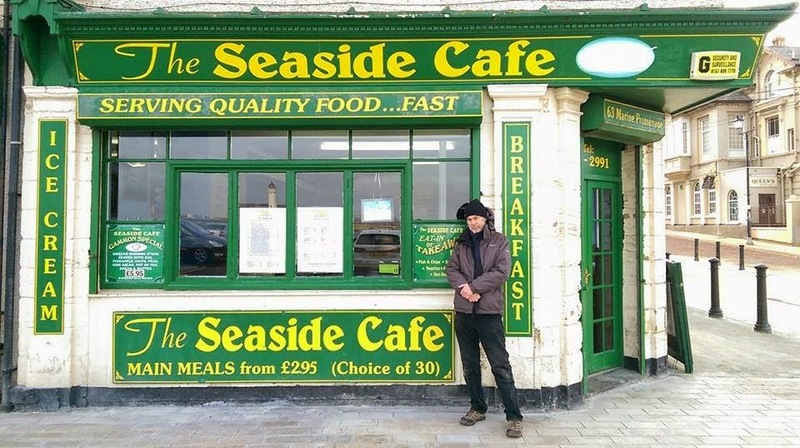 I have a couple of regular Patch cafes that I patronise before or after some birdwatching, but I'm off Patch today so this choice is a shot in the dark. It is a palpable hit! A steaming mug of tea brings feeling back to frozen fingers. A second breakfast is quickly polished off. ... south of the border - east of the sun. Patches are the way to go! Thanks for the kind comments on my recent posts.